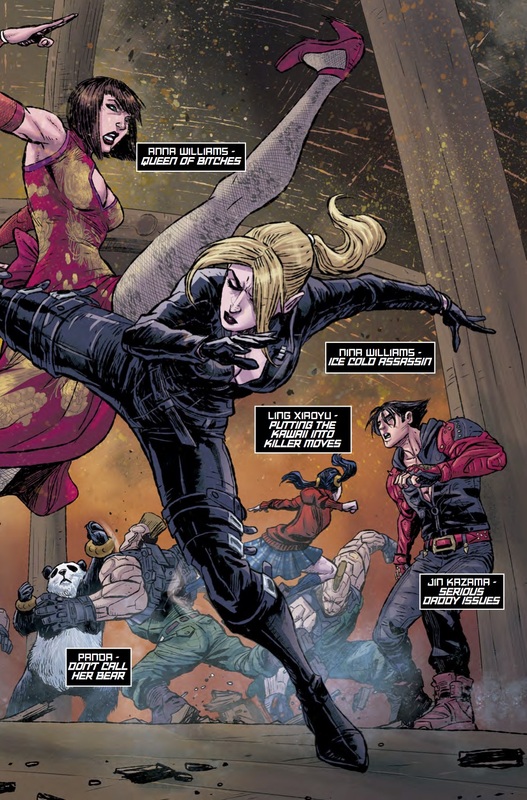 The second issue of the Blood Feud story-arc of Titan Comics’ Tekken series is finally here, continuing the story of Jin, Paul, Ling Xiaoyu, Panda, Anna, King and Yoshimitsu, and their journey to find Artefact 333. But before they can continue on, they need to survive an ambush from Jin’s father, Kazuya, continuing on from the end of the first issue and his gang that includes Nina and a number of Jack robots. This main scuffle between the two sides takes up most of this issue’s pages, but includes some characters showcasing their distinctive move styles from the main games – King wrestling Kazuya to the ground and Yoshimitsu taking flight by using his sword as a helicopter blade. If this ambush wasn’t enough for Jin to deal with, the Devil Gene inside him wants to make a resurgence. It is taking everything Jin has got to keep it within and avoid a repeat of last time. Whether he will be able to keep it under control throughout the rest of the arc however, remains to be seen. robot that fans of the series will know as having played a crucial role in the later entries of the games. The Tekken comic series so far has been very thin on plot but high on fan service. Speaking primarily as a fan, I am more than okay with that. Seeing King, complete with Tapout branded t-shirt, grab Kazuya in a sleeper hold really did put a smile on my face. Speaking of outfits, it’s clear the artists have studied the character models well enough to be able to design outfits that would easily fit in each character’s respective wardrobes; Anna, with her not all that practical long dresses, Jin in his more casual hoodie and Kazuya in his signature white trousers and red gloves combination. Facial art is, for the most part at least, in keeping with the characters also. This was a criticism of the first issue but seems to have improved for the second issue. There are still a couple of panels where characters faces do not look quite right, but these are minor inconveniences when the characters are in the heat of battle. The humour remains in infrequent bursts, and this is largely handled by Paul and his one-liners. He even manages to use the word ‘Chicken’ at one point and I can’t help but feel this is harking back to the series’ highpoint in Tekken 3 where the ‘Chicken’ sound effect originated. 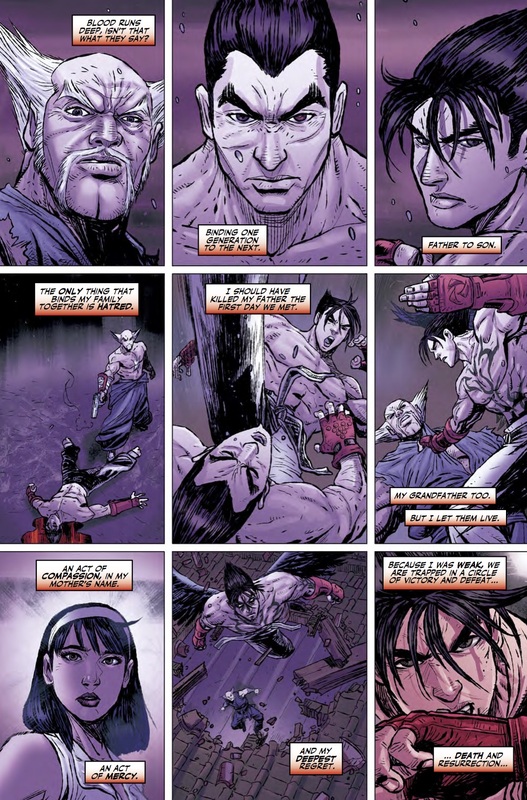 All in all, as it stands, the Tekken comics will not be remembered as classics when it comes down to it. The story has been done a thousand times before and even after two issues it begins to feel a bit dragged out. But this isn’t why they were written. 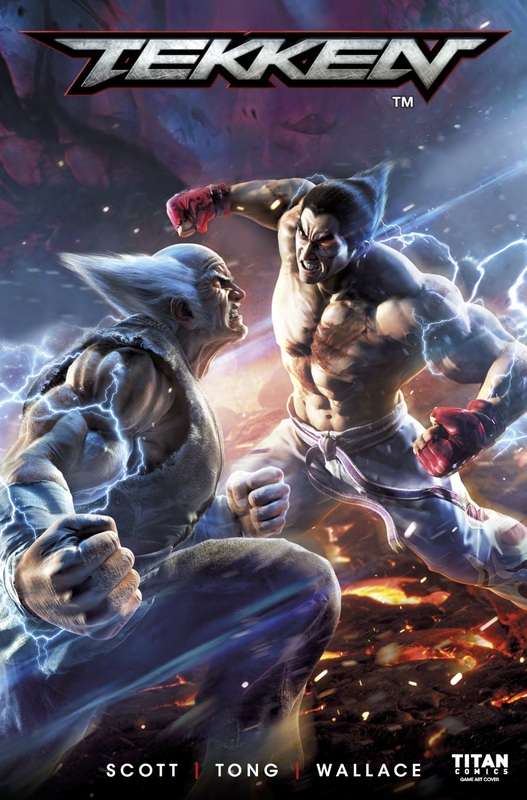 They were written for fans to digest these characters in a different way, and act as a filler between Tekken 6 and 7. The fact that 7 has now been released and these are still ongoing suggests some sort of delay but honestly, seeing these characters in a different medium and having true interactions with each other is more than enough to keep me invested.